Yesterday, on the liturgical calendar, was the day known as Palm Sunday. It is, in Western Christianity, the beginning of Holy Week. We remembered yesterday that triumphal entry when Jesus rode into Jerusalem on a colt and was praised with cries of "Hosanna!" by the people who lay their coats and palms on the ground like a red carpet being rolled out for the king. Hosanna, this word that they shout is a shout of adoration but also a plea to be saved. Hosanna could be read as savior or save us, both of which convey this meaning. There is some hope in being rescued here, some prayer for liberation in these cries. This is the scripture that would come to mind for all of those in Jerusalem. This is why those who are desperate and poor and hurting and know that they need saved cry out to him "save us!" This is also why the priest and the scribes and the pharisees and all of those in religious leadership are appalled and cry out "Blasphemy!" Today is known as Holy Monday. In Mark there is an event that takes place the morning after this entry into Jerusalem. and so today is the day that we remember that event. I personally like Matthews telling of it which does not fade to black or transition days but shows Jesus riding straight into the city of Jerusalem and entering immediately into the temple where he begins to raise hell. He sees tables set up to exchange the money of foreigners for a profit, he sees doves and other potential sacrifices being sold to the poor, and he sees religion being used by the powerful and the wealthy as a way to extort and exploit the faithful poor who have arrived to make offerings to their God. He sees this and he begins flipping tables and throwing their monies on the floor and screaming about theft in His Father's house. 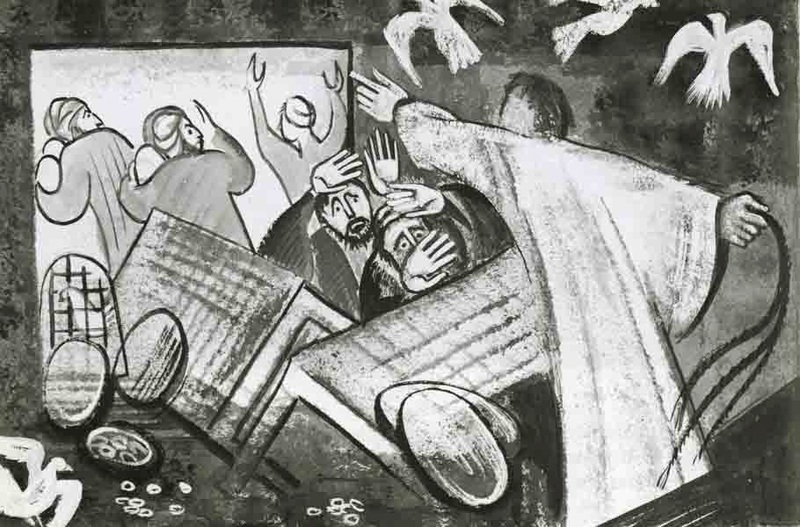 In Matthews rendering of this story in chapter 21 of his gospel we see Jesus kicking over tables and turning to care for and heal the poor in this same act. He kicks over the tables of money changers in this famous and for some infamous exercise of judgement and authority. He chases thieves out of the temple in what seems to be his greatest exorcism yet and while doing that stops to heal what Matthew calls "the blind and the lame." If ever there is a place to point for an argument that He comforts the afflicted and afflicts the comfortable it might be this passage. As he flips table and comforts the hurting there are children screaming and echoing those cries they heard just outside the Temple doors "Hosanna! - Son of David!" The cries for salvation and liberation continue into the Temple and the chief priest and teachers of the law ask him indignantly "don't you hear what they are saying to you?!" He then turns to these religious elite, these leaders and teachers of Torah and asks them "have you never even read the Psalms?! Have you never read "From the lips of children and infants you, Lord, have called forth your praise"?!" After he has kicked over the tables and healed the sick and challenged the teachers of Torah he simply leaves to go camp in Bethany with his little band of revolutionaries. And so the stage has now been set, the challenge has been laid down, and the cross on which he is to be executed alongside other revolutionaries is now impending. And he goes to sleep. As I reflect on this story today I am filled with awe at this Jesus who would even be interrupted from starting a revolution in the temple to comfort and heal the broken. I am in awe of this Jesus who would boldly speak truth to power and act just as boldly to embody those convictions. I am captivated by this Jesus who would act on behalf of others even when the cost would be his very own life. I am grateful for that very character to whom I cry out "Hosanna, Savior save me, rescue me, liberate us all!" May this same Jesus disturb you where you are comfortable and comfort you where you are afflicted.